The Visibility Project: faces, stories, and histories of Queer Asian American Women and Transgender communities, is a national photographic and oral history project by Oakland-based Queer Japanese American artist Mia Nakano. A primary goal is to breakdown stereotypes that individuals within this larger community face, and visually challenge broad assumptions of how Asians or LBTQ people are supposed to look like. The project also empowers participants by providing an opportunity to share their stories, pluralities, and intersectionalities reflecting individuality through intimate interviews. These interviews can take any path the participant wants and they are posted on the Visibility Project website (www.visibilityproject.org) in chapters. Next, powerful portraits are taken of participants, representing themselves however they choose. Nakanos goal is to do at least one photo shoot in all 50 states. 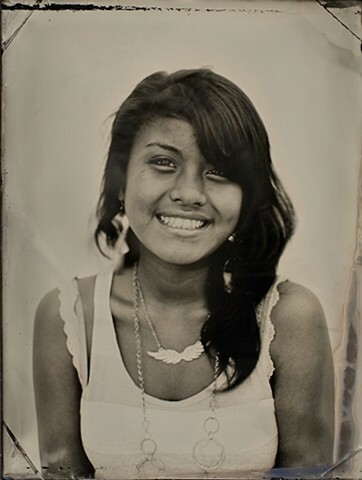 This series of in-camera tintypes are of youth in East Oakland who were/are a part of Banteay Srei, a grassroots organization dedicated to providing support for at risk youth of Southeast Asian descent. Banteay Srei builds community, provides historical cultural education, and empowers young women through visual art, food justice workshops, and more. The young women who staff and participate in Banteay Srei are primarily first generation immigrants from Cambodia, the Philippines, Vietnam, Thailand, and Laos. Wookie, TI, and Ya Ya who are seen in the photographs, comprise 75% of the staff. They began as participants in the program and have become leaders in the movement to end sexual exploitation and gang violence in East Oakland.